There are several important botanical collections in central Arizona including the Desert Botanical Garden in Phoenix, but perhaps the best and most comprehensive is 50 miles east near Superior, along US 60. This is Boyce Thompson Arboretum State Park, which occupies a 326 acre site at the foot of the Superstition Mountains, in the upper Sonoran Desert. 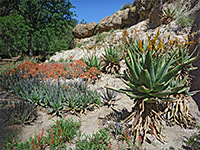 Around 4,000 plant species may be seen here, the majority from desert regions of the Southwest and Mexico, but also many from elsewhere, in South America, Africa and Australia. 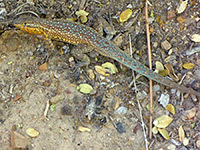 Unlike the Arizona-Sonora Desert Museum near Tucson, there are no captive animals, but some 70 native species have been spotted in the gardens, plus 210 types of birds. All exhibits may be toured by a circular, 1.5 mile trail and several shorter loops, which together require about three hours to walk with limited stops; a full day is recommended to see everything in detail. One section of the pathway, towards the east, crosses undeveloped desert, where plants can be viewed in a natural state, while the remainder passes through cultivated areas. 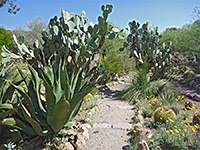 The gardens were established in the mid 1920s as the Southwest Arboretum by engineer and philanthropist William Boyce Thompson, situated next to a narrow riparian corridor along Queen Creek, surrounded by arid lands typical of the habitats of most of the plants in the collection. Today, the site is managed jointly with two partners, University of Arizona who assist with research and conservation, and Arizona State Parks who manage the public facilities. Thompson, the founder, resided for a few years in the Picketpost House, just east of the gardens; he died in 1930, deprived by illness of his anticipated lengthy retirement in this peaceful location. 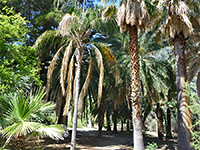 Boyce Thompson Arboretum is easily reached from Highway 60, near the east end of its divided, freeway section. Fees (2019) are $12.50 for adults, $5 for children, free for the under fives. Entry is past a bookstore, gift shop and plant sale area; the main loop, all paved but not all wheelchair accessible, starts just beyond, and is approximately half through desert habitats and half through the wooded environment close to the creek; this latter part has a great variety of trees including palms and eucalyptus. Drinking water is available by the entrance but not elsewhere. 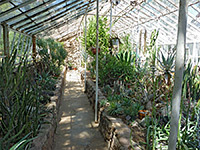 A selection of more delicate plants, mostly cacti and other succulents (largely from South America and Latin America) are housed in greenhouses, though all other specimens are outside. Plants are well labeled, and many species occur in multiple locations. The northwest part of the loop runs close to the highway, within range of traffic noise, but the remainder is quiet. Australian Desert; trees, bushes and other plants from Australasia. Cactus and Succulent Garden; over 300 varieties of cacti and other succulents grow here, though still by no means all species from the Southwest. One type discovered at this location and named after the benefactor is echinocereus boyce-thompsonii. Central America is well represented, plus Baja California, where cacti include the cardon (pachycereus pringlei) which is the world's largest cactus, growing taller even than the giant saguaro. Chihuahuan Desert; desert plants of south New Mexico, west Texas and north central Mexico, viewed by the 0.3 mile Curandero Trail. 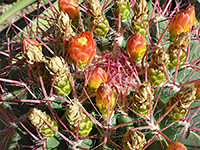 Sonoran Desert; plants native to south and central Arizona, and northwest Mexico, also viewed by a 0.3 loop trail. South American Desert; a smaller group of plants from Argentina, Bolivia and Paraguay. Taylor Legume Garden; this small enclosure houses flowering plants from the pea family (fabaceae), many of which are edible.